President Obama told congressional leaders Tuesday that he does not need their authorization to expand military operations against the Islamic State—and at least for now, most leaders are not arguing. Obama held a more than hour-long meeting with the top four congressional leaders Tuesday afternoon, one day ahead of a prime-time address during which the administration says he will lay out a comprehensive strategy to "degrade and ultimately destroy ISIL," the jihadist group sweeping through Iraq and Syria. "The President told the Leaders that he has the authority he needs to take action against ISIL in accordance with the mission he will lay out in his address tomorrow night," according to a readout of the meeting from the White House. He did, however, add that "he would welcome action by the Congress that would aid the overall effort and demonstrate to the world that the United States is united in defeating the threat from ISIL." 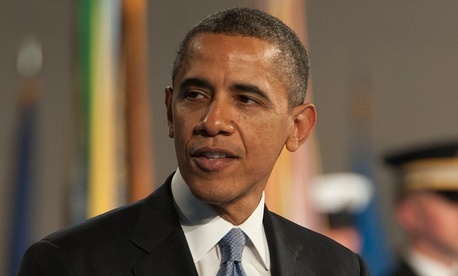 Obama's position is aided by widespread public support for striking targets in Iraq. A new ABC News/Washington Post poll found that 71 percent of Americans support the U.S. striking targets in Iraq, and nearly as many, 65 percent, support striking ISIL in Syria as well. Members of Congress, though widely supportive of military action, are split so far on whether the White House must ask for authorization before ramping up any campaign in the Middle East or in the event the existing bombing against targets in Iraq goes on for a long time. Leaders have been less vocal. Asked earlier in the day whether he believes Obama should ask for Congress's permission, House Speaker John Boehner hedged, saying that he has to hear from the administration exactly what their plan is first. Boehner, who is suing the president over alleged executive overreach elsewhere, has not explicitly called for congressional authorization and, according to a lengthy readout from his office, did not ask Obama to seek approval from Capitol Hill at Tuesday's meeting. But Boehner stopped short of lending support for a full-scale military invasion, which Obama already has said he will avoid, saying instead he would support training and special forces. "The Speaker stated he would support the President if he chose to deploy the military to help train and play an advisory role for the Iraqi Security Forces and assist with lethal targeting of ISIL leadership," according to a Boehner aide. Republican leaders aren't all following the same playbook. Unlike Boehner, Senate Minority Leader Mitch McConnell, who is in the midst of a tough reelection campaign, said earlier in the day that he believes Obama should seek authorization for any military action he decides to take, and he noted there would be widespread support in Congress. "The president should be seeking congressional approval, period, for whatever he decides to do, because that's the way you hear from those of us who represent the rest of the country," he told reporters. House Minority Leader Nancy Pelosi, on the other hand, agrees with Obama that he does not need congressional approval, according to her spokesman Drew Hammill. But Pelosi noted in an interview before heading to the White House that the dynamic has changed from last year, when Congress dealt Obama a blow by denying him authorization to strike Syria. "There was absolutely zero appetite in the public, I would say, a year ago for the initiation of hostilities," Pelosi said. "In the public there's a different attitude," which will be reflected in Congress. Senate Majority Leader Harry Reid has not said publicly whether he would demand that Obama ask for military authorization. Some committee chairmen and rank-and-file members, however, have been vociferously calling on the administration to clear military action at the Capitol. House Foreign Affairs Committee Chairman Ed Royce and ranking member Eliot Engel have noted that they want to weigh in legislatively on any protracted military campaign, and have invited Secretary of State John Kerry to testify on the subject next week. Their counterpart in the Senate, Bob Corker, said on CNN earlier Tuesday that he also believes Congress should be consulted. "Obviously I think the president should come to Congress and ask for authorization for use of force.… I think it would be extremely lacking [in] judgement for him not to come seek that from us," said Corker, the top Republican on the Foreign Relations Committee. He joins a long list of senators from both parties who have called on the administration to ask for authorization. White House strategists claimed the high ground by saying Obama wants to educate the public about what press secretary Josh Earnest on Tuesday called the "core national security threat" the U.S. faces with the Islamic State. Politically, Obama appears to be putting Republicans in a box—they can't appear to trash the commander in chief on a national security issue, but they don't want to complicate their fall electoral strategy by praising Obama. "They've got a problem," a prominent Democratic official with close ties to the White House toldNational Journal. "They've made Obama's screwups the core of their campaign strategy. So they can't give him any credit even though many of them agree with what he's doing. That undercuts their national message of his incompetence." Michael Catalini and Tom DeFrank contributed to this article. This article appears in the September 10, 2014 edition of NJ Daily as Obama Prepared To Strike ISIL Without Hill OK.